Fangirls, I love Captain Marvel. I love that she has a strong relationship with her friend’s daughter, she deals with stuff that a lot of us have to, and she’s a phenomenal lady. 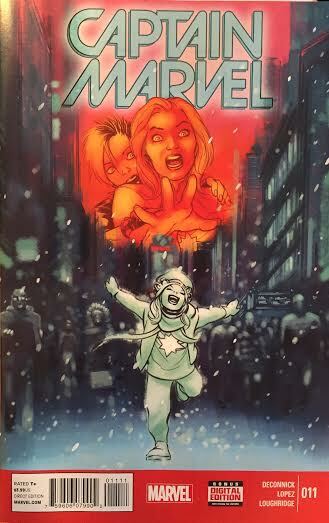 In this issue, she’s back in New York for one night only; and it’s Christmas Eve. Her friend and transport, Lila Cheney, freaks out when they land, realizing that she hasn’t done any shopping for anyone yet, but Carol has one goal, to visit Mrs Burke, her old friend who is in a coma. While she’s visiting Burke, she falls asleep, and wakes up to Grace Valentine and June Covington, who cuffed her in her sleep. They put her back under so they can transport her. Their end goal is to take Captain Marvel’s powers away, and give them to themselves. For pretty obvious reasons, Danvers isn’t super into that idea. So she fights them, and it’s looking pretty even a fight until Santa Claus shows up. 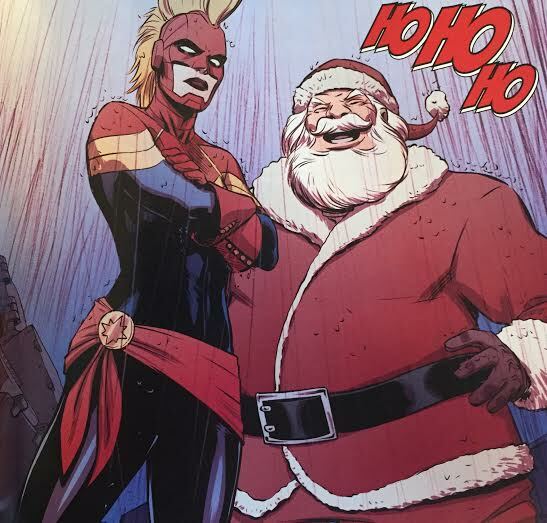 You read that right, Fangirls, Santa Claus is in this issue. He breaks the cuffs off of Carol, and loans her his sack, hat, and jacket so she can save New York from explosives. 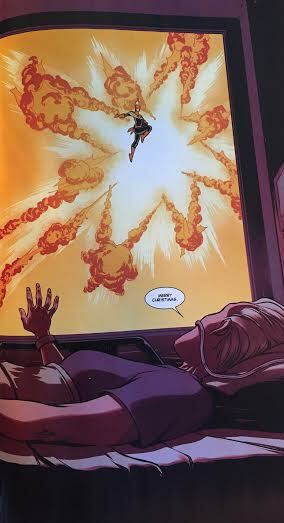 The final panel made my heart sing, Fangirls, because it shows Captain Marvel with a massive explosion behind her (in the shape of her star), from Burke’s hospital room. Ms Burke’s hand is reaching towards the window, and she says “Merry Christmas” and it’s the best damn Christmas miracle since Scrooge became less of a grump. 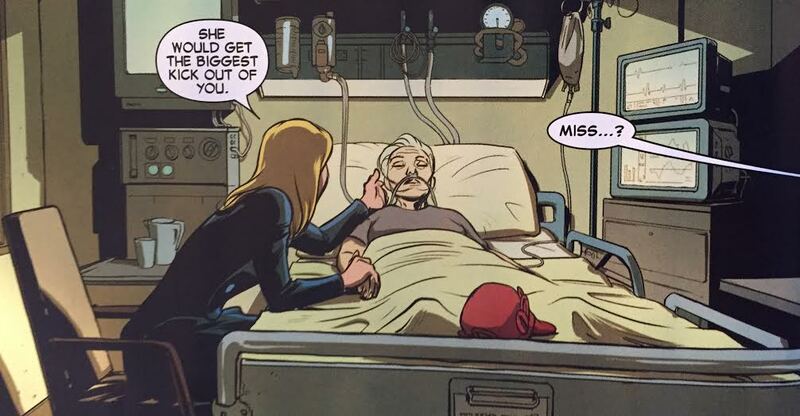 I know I’m eternally behind on Captain Marvel, and I hope you’ll excuse it Fangirls, but in just one week I’ll be graduating from college and have more time to read and write, and hopefully make this an even better experience for all of you. May the Fourth be with you! 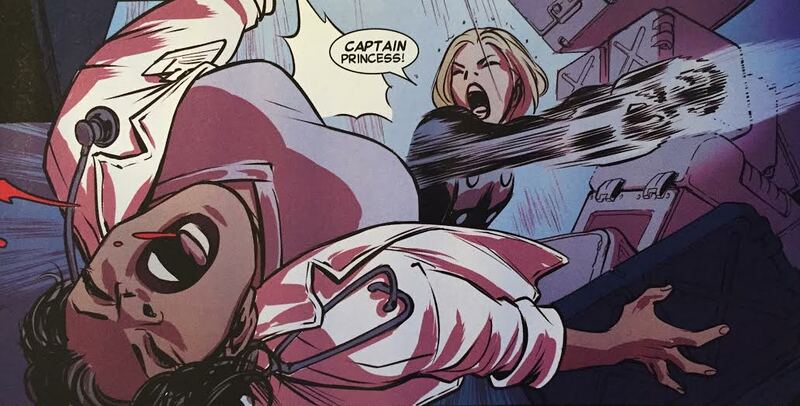 Own that princess title, Carol!